Climate change may have more far-reaching consequences for the conservation of marine mammals than previously thought, according to new research. In Shark Bay in Western Australia in early 2011, a heat wave caused the water temperatures to rise to more than four degrees above the annual average. The extended period caused a substantial loss of seagrass, which drives the Shark Bay ecosystem, in this coastal area, a UNESCO world heritage site. Researchers investigated how this environmental damage has affected survival and reproduction of dolphins using used long-term data on hundreds of animals collected over a 10-year period from 2007 to 2017. Their analyses revealed that the dolphins’ survival rate had fallen by 12 percent following the heat wave of 2011. Moreover, female dolphins were giving birth to fewer calves—a phenomenon that lasted at least until 2017. There are several possible explanations for this phenomenon, for instance neglect of calves, increased newborn mortality, delayed sexual maturity, or a combination thereof, but researchers have not yet been able to investigate them in detail. Interestingly, the heat wave did not have the same effect on all dolphin groups. Dolphins that use sponges as tools—a socially learned foraging technique that helps dolphins locate food in deep water—were not as badly affected as those that do not use this technique. “Nevertheless, our work raises concerns that such sudden events might have quite negative long-term effects even in groups of marine mammals that are known to adapt usually well to novel environmental conditions,” Wild says. 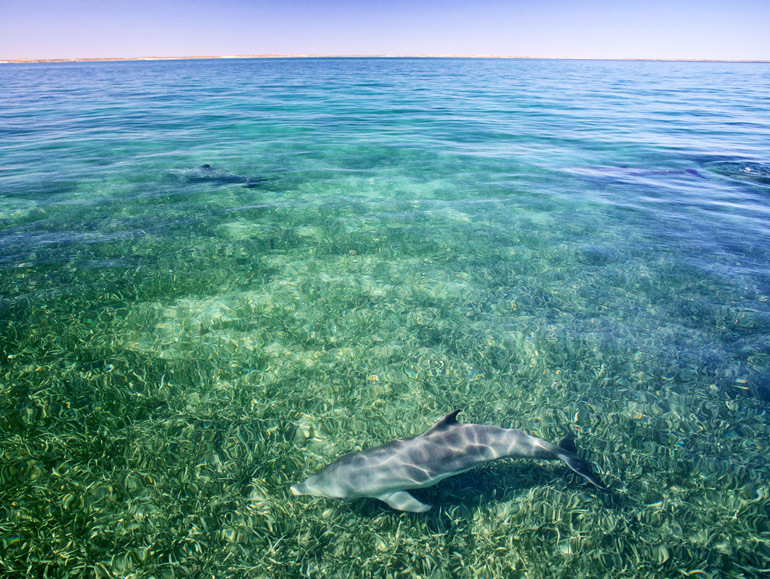 The researchers show in their study for the first time that marine heat waves not only affect organisms at lower levels of the food chain, but also might have considerable long-term consequences for the animals at the top, such as dolphins. The research appears in Current Biology. The Swiss National Science Foundation, the National Geographic Society, the SeaWorld Research and Rescue Foundation, the W.V. Scott Foundation, and the A.H. Schultz Foundation supported the research.